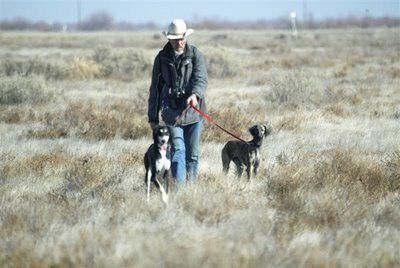 I was thinking about my unsuccessful hunt on Sunday, and how totally unaffected by my failure was my dog Rina. She was just as happy at the end of the hunt as she was at the beginning, and was still busy finding birds long after my hawk had given up trying to catch them. I wrote in my falconry blog: “Most folks will help you spend your winnings, but fewer will be your friends in defeat. This is one of the great and oft-acknowledged benefits of owning a dog.” Not exactly ground-breaking news, but true enough. On reading the day’s entry, a friend forwarded the eulogy of Old Drum, a coonhound killed unjustly in 1869 and avenged in court by his outraged master. The trial was eventually won ($50 award to the former owner) in large part by this moving passage, delivered by the owner’s legal counsel. …..of the January odd-ball band name contest. 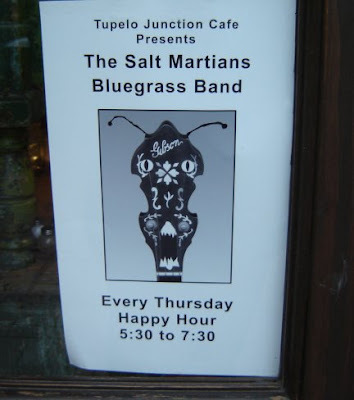 Salt Martians? 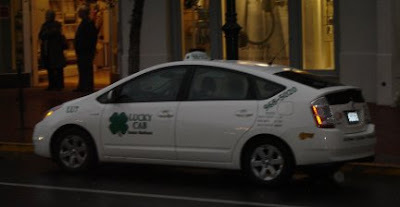 Have Toyota Prius taxi-cabs made it to your town yet? This is the first one I’ve seen here. Actually, my previous general observation about taxis in this town has been what a high percentage here are made by Mercedes-Benz. Last Fall I posted on some unusual sidewalk art that we sometimes see here in town, but I was taken aback at this inflatable, multi-tentacled, organic-looking thing installed on the top of an art gallery downtown. I suppose it might have been put up in honor of the annual Santa Barbara Film Festival that had our downtown set all ahoo last week. Saturday evening I walked past the Arlington Theater where the street had been blocked off. A gang of workmen was setting up awnings and special lights for a red capet walk. That evening, Tom Cruise was set to be the celebrity presenter to give Will Smith a Master of Modern Cinema award. I like Will Smith and he has done some good work, but how old is he? Isn’t he a little short in the tooth to be getting a career achievement award? It was just five-ish, but people were already lined up (in the drizzle) at the barracades and staking out tables at Carlito’s Cafe across the street to look at the big names. Like catch-and-release fly fishing, there is such a thing as catch-and-release falconry. It is not so widespread a practice among falconers as it is among anglers, but its practitioners espouse many of the same arguments in support of it. For what it’s worth, I strongly disapprove. This week I received a very cordial letter (actual words on paper! ), with a collection of vintage hawking photos and copies of two articles, all by a longtime falconer from the Southwest. The letter expressed the author’s concern, or maybe just his puzzlement, about my position on catch-and-release, which I outlined a couple years ago in an essay printed in our falconers’ association newsletter. My correspondent is no fake falconer. He has been hawking successfully since before I was born. His articles are well-written and sincere, and correctly point out the fact that some falconers have been releasing game systematically for centuries. There was once an entire branch of our sport dedicated to catching herons and other large, “uneatable” birds, ringing them for posterity with a metal band and then releasing them. Purely sporting. My reply to this falconer follows. I reprint it here with Steve’s blessing, because I think it touches on some issues that define our sport and that frame my own defense against anti-hunting / anti-cruelty sentiment. Naturally, I don’t expect the anti-crowd to split these hares, but it’s useful to me, at least, to know where I stand. “… I was, as you guessed, very interested to see your accounts of catch-and-release falconry. My opposition to releasing live game is not categorical. I have hastened to pull my hawks off “miscellaneous” animals, especially dangerous ones such as cats and raccoons that are sometimes taken by accident. My intention is foremost to save the hawk from harm and, if possible, prevent any harm to the prey animal also. These are exceptional circumstances, more frequently occurring with very young hawks and rarely after a good first season of successful hunting. Since I tend to fly the same individual birds for multiple seasons, this doesn’t happen often. Another, perhaps related, circumstance would be one in which a prey animal manages to escape numerous attempts on its life by the hawk, yet remains “catchable” in some vulnerable refuge of last resort. These are frequent enough situations, as you know. In these cases, if I do not need food for the hawk or want it for myself, I’ll leave the animal alone, knowing it might not be so lucky next time. That said, my goal at the onset of every hunt is to kill what I’m hunting. The pleasures of a day in the field with a hawk are manifold (of course! ), but the point of the day, in my opinion, is to seek, find and catch what I’m after. My goal is not the glory of the flight. Falconry is not primarily an aesthetic pursuit for me. I hope that doesn’t sound monstrous! I place a high value the art of falconry, but I expect it to emerge as a natural outcome of the hunting, not the reverse. My feeling is this: My hawk is serious about his hunting. My dog is serious about hers. The prey is deadly serious about getting away from us. Who am I to take this situation so lightly as to make it into a game? You asked: “Who says falconry has to be a blood sport?” I say the animals do, and so do I.
Compassion, moderation, conservation—these are not alien concepts to me. I understand that catch-and-release falconry is often explained as a humane means of enjoying sport today while preserving it for the future. But my approach to honoring these ideals is, instead of hunting and releasing caught game, to cultivate an appreciation of natural limits. The natural limitations of falconry include the hawk’s fitness (and mine), its skill as a hunter (and mine), the hawk’s appetite, the weather, our available land and the abundance of quarry, to name a few. My personal definition of success in hunting serves as another limitation: A hunt is successful when it ends in a kill. It is not necessarily more successful with multiple kills, but depending on one’s goal for the day (e.g., stocking the summer larder, or building drive in a young hawk), more is sometimes better. In either event, the hawk’s desire to kill motivates the hunt, and its willingness to continue—not mine—sets the limit. Nothing my hawks kill is wasted. The quarry feeds the bird or both of us. The hawk eats no more than it needs from day to day, and I freeze no more than I will use before the next hunting season begins. I hunt a series of several fields in rotation, switching to the next if slips become scarce—although I have never exhausted any of my fields, as years of consistent daily bags show. My belief, based loosely on my experience studying the ecology of wild raptors (three wonderful years tracking radio-marked Cooper’s hawks, dawn to dusk) and also on the accumulated hawking experience of myself and friends, is that game populations need no special protection from falconry. Conservation is served by matching the right hawk with the right quarry (usually meaning its natural prey) in its native habitat, and by following the natural limitations of the sport. As I get older, I appreciate these limitations all the more. I now practice a form of falconry that requires little driving and a lot of walking. It needs no gadgets or electronic aids; it is extremely low-tech hawking. My commonest quarries include small birds and rodents, which my hawk eats on the spot. A typical hunt entails a hike in a wide circle of fallow cow pasture and ends when the hawk is full. With a young family to look after, I hunt no more than four days a week, and I can manage only a single hawk. So I see moderation and conservation as integral to my falconry, despite the fact that I do not release what we catch. But what about the “humane treatment” of our prey—is that enhanced by letting it go? I don’t think so. My pet phrase for the reason why is that “there are no barbless hawks!” True, the largest animal that any hawk is capable of catching can sometimes be released without apparent harm. But I doubt (after cleaning thousands of animals brought to bag by hawks) that “apparent harm” is the same thing as “no harm.” If its talons are sharp, and its appetite and physical condition are good, my bird can be expected to do considerable harm to its prey in a short period of time. 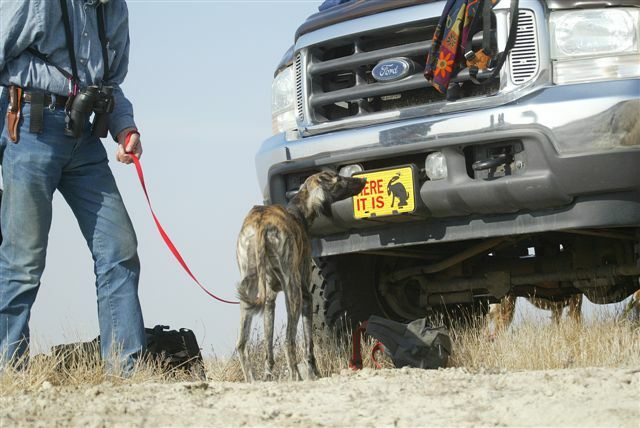 It is literally trying to kill the animal, and it is well equipped to do so. I disagree that we can assume released prey runs or flies away no worse for wear. But let’s imagine, for a minute, that it invariably does so. What have we then accomplished? 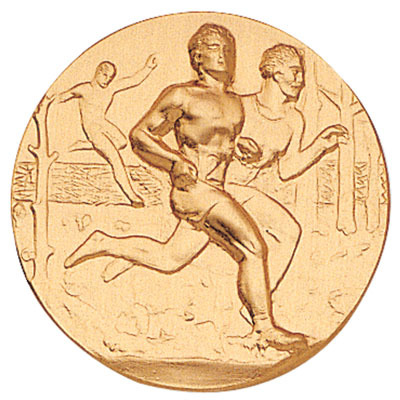 In my view, we have accomplished by catch-and-release the reducing of our grand, natural sport to a mere human game. We have ignored the serious intentions of our good hawks and dogs and shown such disrespect to our quarry that we would, in effect, be risking its pain and discomfort to satisfy our aesthetic needs and nothing else. We deny our prey the basic honor of escaping by virtue of superior ability on the one hand, and the gift of a swift dispatch on the other. Say: Do we think this duck is not going to die another day? Do we imagine that the wild hawk or owl that finally does it in will consider its pain while eating the bird to death? In my view, if we intend to hunt at all, killing what we catch is the most “humane” course. While my tiercel Harris’ hawk is well equipped to catch and mortally wound a rabbit, I’m better at killing one quick. Moreover, I’m the only one of us who gives that a moment’s thought. I hope the above rambling provides some answer to your inquiry about my feelings. Please note, there are certainly no hard feelings on my end and no serious disagreement over this topic, which must remain a matter of personal choice. 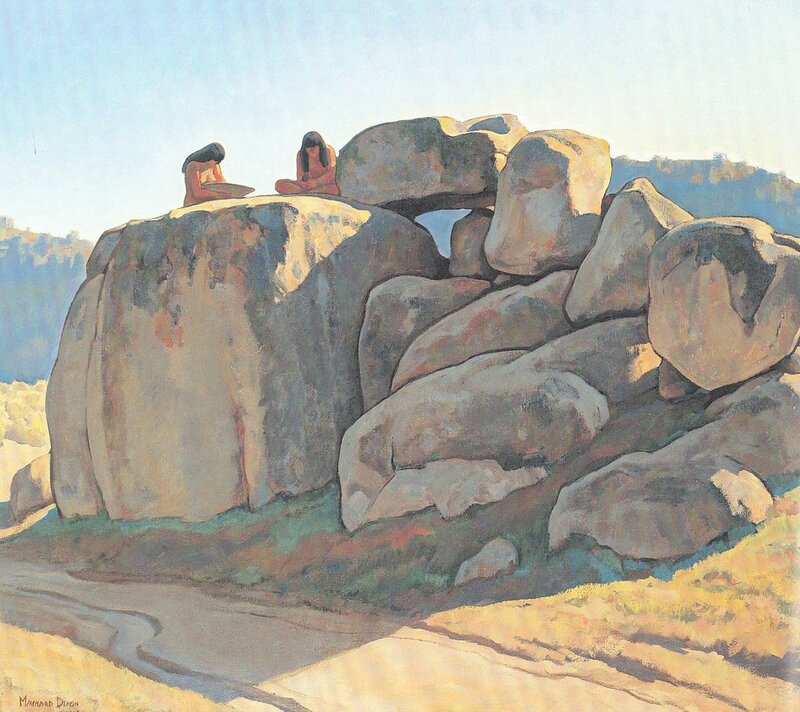 I have continued reading the book about Maynard Dixon that I discussed in an earlier post and discovered that in the spring of 1930 he spent some weeks sketching and painting near the town of Tehachapi, California. Tehachapi is set in the Tehachapi Mountains, the southernmost range of the Sierra Nevada, and is a beautiful place where we were fortunate to live for six years. Dixon’s work captures the spirit and beauty of the place and I scanned these paintings to share with you. The one above is “Storm on the Tehachapi”. The one above is called “Deer Heaven” and shows the oak savannah habitat that is so common in the area. This won second prize in the annual exhibit of the San Francisco Art Association in 1930. 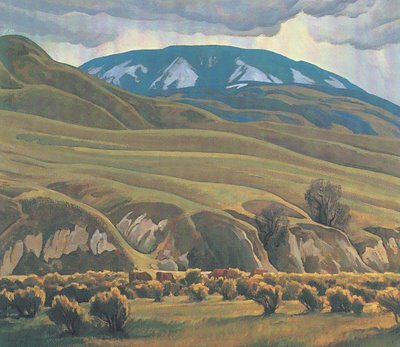 The top prize was won by another Tehachapi painting of Dixon’s, “Merging of Spring and Winter” which wasn’t illustrated in this book. “Deer Heaven” was also included in the Corcoran Gallery of Art’s Thirteenth Exhibition of Contemporary American paintings in 1932-1933. 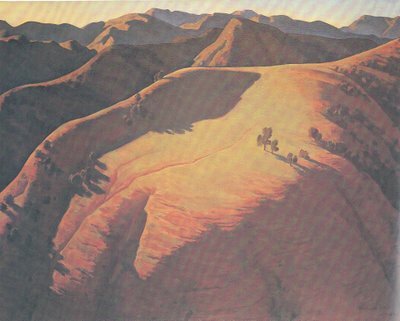 This painting is titled “Springtime on Bear Mountain.” Dixon was staying in the small community of Caliente that lies on the north side of Bear Mountain, and this is a view from that side. While we were there, we lived in Bear Valley at the foot of the south side of this mountain. The jury at the San Francisco Art Association exhibit also singled this painting out for praise. And I especially like this painting with its Native American theme that is titled “Neolithic Afternoon.” One of the charming aspects of the landscape of the area are these clusters of large granite boulders that randomly dot the valley floors. They just won’t quit! Margory Cohen just sent me a link to this NYT piece on how PETA has distorted the research efforts of a biologist working with sheep, leading to misrepresentations of his work and even death threats! Libby suggests mandatory spay- neuter for PETA members and other A. R. activists. Hmmmm…. You may have read about the National Guardsmen who fled their post under the threat of invasion by armed intruders from Mexico and are now being rewarded for it. Reid sent LAT article on wolves returning to Germany which seems to indicate that wolves are as polarizing there as here. “..Joachim Bachmann, a hunter with a wall full of trophies, is not so lyrical when it comes to the wolf’s reappearance amid the birch and pine of the eastern woods in Saxony. “In today’s Germany, the wolf is a “protected species.” Mention these two words and you’d better duck, because Bachmann can’t quite get his mind around how a sheep-eating machine should not be shot on sight. It bothers him even when he sits at the big table in his big house looking out the window to a damp land speckled with paw prints. ” “What positive thing does a wolf bring to nature? Nothing,” he says, cutting his schnitzel and salted potatoes. “There is something else out beyond the winter grass that perturbs him too. Down the road, past a church and through a forest so dense it seems like walking through the bristles on a hairbrush, a woman Bachmann describes as a misguided Little Red Riding Hood charts the personalities and nocturnal habits of wolf packs. Somewhere at the root of all the controversy is some sort of failure to see the wolf as an animal, a splendid predator of no human virtue or vice, rather than as a symbol of either the evil outside of human control or of a vanished innocence. I DO feel that despite the wolves’ North American rep for never having harmed anyone (recently refuted by the killing of a geologist in Canada– I have asked Valerius Geist for details) that sooner or later human- habituated wolves are going to eat someone or, worse, somebody’s kid. Big predators DO; it doesn’t prove them evil, just to be dangerous animals worthy of respect and caution. I had an exchange with Matt over this and he suggested I add it here. “Wolves eat children in India all the time, and have been implicated in attacks on humans in Russia. They ate humans in Europe probably into the 1700’s. “LOTS of lions eat people all over Africa every year, even in parts of South Africa. It is not emphasized by most governments. “Crocs eat some and hippos kill more but don’t eat ’em. “In Zimbabwe everybody had tales. Lions at the gate after dark scared the crap out of me once (I was in an open car). And not too far from there I got out of the car to pee on a dirt track near Hwange Park we were using for a short cut ( don’t know WHY I did in retrospect– we had already flushed a Cape buffalo and had to wait for a feeding elephant to depart and detour around the tree it had dropped). Mrs. Muza, the gov’t aide, didn’t want me to get out– she said a “European” had had a car break down near there not long ago and was walking out when he was eaten. “Tigers are no longer doing well enough in India to be a threat, though, except in the Sunderbans where all the tigers eat people and there are still rather a lot. 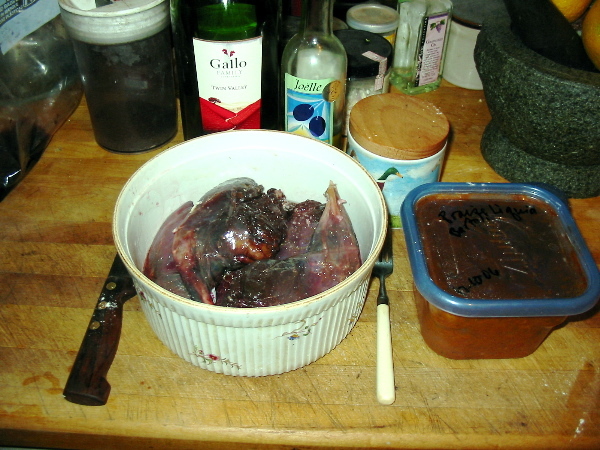 The post below reminded me that I never posted pics of our hare meal a couple ofweeks ago. 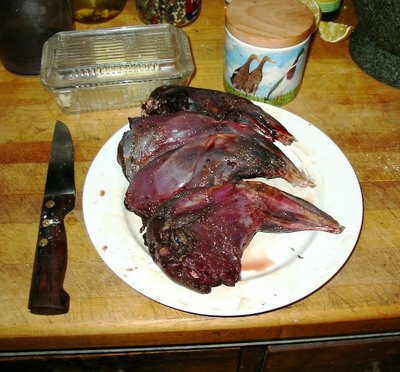 Here are four quarters of hound- caught hare, courtesy of John Burchard and his dogs. Tigger is becoming extremely intelligent– John tells me she is learning to read. As you can see, utterly un- shredded by the eevil predators. And let it bubble away on the woodstove for hours. Unfortunately, we were so hungry when it was ready we forgot to take “finished” pics!